Jason Atton - Big Jay - has been a friend of mine for almost 20 years. He being the age that he is, this means I've known him for half his lifetime. 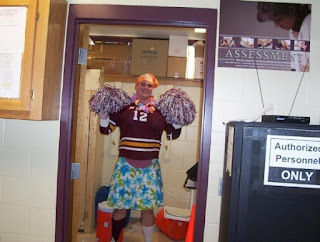 Big Jay has always been an athlete. You name the sport, he's probably played it. And not only has he played it, he has probably excelled at it. 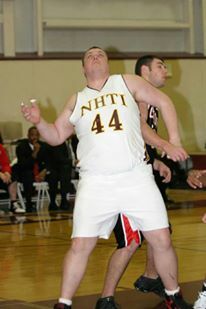 He played college basketball and won the USCAA national championship with NHTI (New Hampshire Technical). I've played with him on a championship team in men's fast-pitch softball (and it was his pitching gem, on the final day of the regular season, that clinched first place for us, even though... well, more about that later.) I know few people who understand the nuances of games more quickly than Jay, and whose physical gifts could as readily make use of that intelligence. Jay has tremendous reflexes and great hand-eye (as well as foot-eye) coordination, and those are gifts, but it has always been his grasp of the details that impresses me. He may be the smartest player with whom I've had the pleasure of sharing a softball field. That surprises some people when I say it, but it's the truth. The reason it surprises some is because Jay has a great sense of humor and he often plays the fool just to get some laughs. Because he has such a firm grasp of the rules of various sports, Jay is also a referee/umpire. He earns a good portion of his living reffing football, etc., and it's never a good idea to challenge Jay on a rules interpretation. He just plain KNOWS. Now, about that softball game I mentioned earlier; the one he pitched for us to clinch first place in the regular season? That was in 2014. Jay ended that day laying on the bench, absolutely drained, and some of us were truly concerned. It had been a hot day for a game, Jay is a very big man (that's why he's BIG JAY), and his uniform was drenched by sweat. We had no idea how concerned we really should have been. A few months later, Big Jay was in Houston, visiting with family, when he suffered a massive heart attack. There was serious fear that he might have suffered kidney damage that would require a transplant, since he was also diabetic (something some of us didn't find out until then.) He was more-or-less in a coma-like state for a long time, and speculation about his brain function returning to normal was also on the table. I'm happy to report that Big Jay made a recovery from all of it. Hell, happy isn't the word; ecstatic is about right. Lots of people, me included, had prayed hard for the big man. But, since then, Jay's physical state hasn't been totally free from trouble. His diabetes and (I'm the last person to nag, considering my own bad habits, but it has to be said) his lack of taking care of himself led to more bad news. This athletic man, who loves sports so much, had to have both of his big toes amputated. Jay took it with the good humor and grace he has always displayed - immediately after the operation, he said. "Now I can only count to 18..." - but it was a big blow. Jay pretty much had to learn to walk again, let alone be able to go back to sports. Since then, he's engaged in some smaller athletic endeavors, such as bowling. If you didn't know about his particular handicap, you'd never guess it from his bowling. Jay still beats hell out of me (granted, everybody beats hell out of me.) 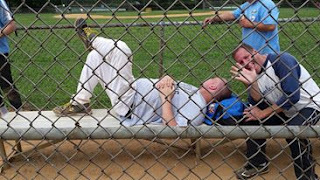 Jay also took the field again to ref football, umpire softball, etc., but the one thing he wanted just a bit more - and which I have wanted to see since his heart attack - was to make a return to a playing field and pitch softball. This past Sunday, he did. Our regular season ended on Sunday, and there was an all-star game and cookout immediately following. In the week leading up to the game, Jay approached me with a GREAT idea. He would be at the all-star game and so would I, but not as players. We would be umpiring the game - me behind home plate, Jay covering the bases. One of Jay's very best friends, and a great guy in his own right, Joe Baszkiewicz, was one of the 24 players chosen to play in the all-star game. Jay thought it would be great fun if, the first time Joe came up to bat, he was allowed to trade places with the pitcher and throw to Joe. The idea was greeted with enthusiasm by everybody who had to be in on it. And so, when Joe Baszkiewicz came up to bat, with one out, Big Jay called time, walked to the pitcher's mound, and - to Joe's surprise - took the ball from pitcher Brian Pacheco and got ready to pitch. I was also in for a surprise. Pacheco walked in to where I was umping behind the plate and told me he would take over. He said I had to catch. The all-star catcher, Tony Hutchins, graciously took a seat on the sideline. Jay had specifically wanted both Joe and me to be involved. I squatted, Joe batted, Pacheco umped - and Jay pitched. It was the first time he had taken the field in that league since that sweat-drenched gutty 2014 game three years before. It was the first time he had pitched competitively since the heart attack that almost cost him his life. It was the first time Jay had thrown a real pitch since losing his two big toes. Big Jay legitimately got Joe out (Joe may be Jay's very good friend, but he was in the all-star game for a reason and he would have loved to have gotten a hit off Jay, I guarantee that.) Then, next up was Drew Atton, Big Jay's cousin, who was pitching for the other team. I stayed catching and Jay stayed pitching. And Jay retired Drew, too, to end the inning. Jay walked off the field to very heartfelt congratulations from both sides. He was legitimately exhausted, though. Eight pitches in a broiling sun had taken it out of him, so he took a seat in the shade and Fast Freddy Goodman took over umping the bases. It was as good as sports gets. That Jay asked for me to be included, as catcher, means the world to me. Hell, I'm getting misty just thinking about it again. Thanks, Big Man. And now, I'm turning this over to Jay, because he wants to say something to all of you. "I want to say how some days were hard going to a Bombers game hurt that I could not be there playing with my family. But even if I only threw 8 pitches today, it was the best feeling in the last two years, and with those pitches it gave me hope that next year I can play with my family. How each person who said they will pray for me, or asked how I was doing, really helped out. The amount of support I received from the league today - the hugs - lifted my spirits. Me pitching to my best friend Joe, and having Sully catch me, and to share the field with my cousin Andrew, might now be my best moment in my sports career, even overshadowing my national championship season. Thank you." How can it get any better. Thanks for this, Sully. High five to Big Jay. Go get 'em, big guy. . .
You are a good one Jay! And you aren't so bad yourself Sully! I meet him in Fb because we had a league in common, and when I meet him in person is a joker like me so we get along and still until this day had some laughs on fb because of him in not so many good day. Thanks for be a nice person and a joker u have bring a laugh and sunshine to people that u had no idea u did. I know is not easy after all he have got, I had a heart attack when I was younger and also lost 2 toe in 1 foot and it wasn't easy so I know some of what he have go Tru. I will shake your hand and give u my respect. I didn't know he was going to be there at the park if not I had stayed longer.see u Soon at the field big Jay. This is a wonderful story. Anyone who has real, true friends can feel that tug at the heartstrings and feel a renewed sense of privilege in having those close friends to love. I hope he lives to be 100!! OK. At the line of your blog that read, "This past Sunday he did. "...I started crying. And I cried happy tears all the way through reading the rest of this blog. To know that Jay pitched and Jim caught just made my whole week! Truly!! What a sight and a high five moment that must have been!! To Jay....I have prayed and prayed for you. I've never met you, and I might not ever meet you on this side of Heaven, but I do want you to know you have a South Georgia friend who cares about your health and happiness, and I'm so glad that you have recovered and are doing well. Your attitude is awe inspiring. Continued health and happiness to you, Jay. I mean that. 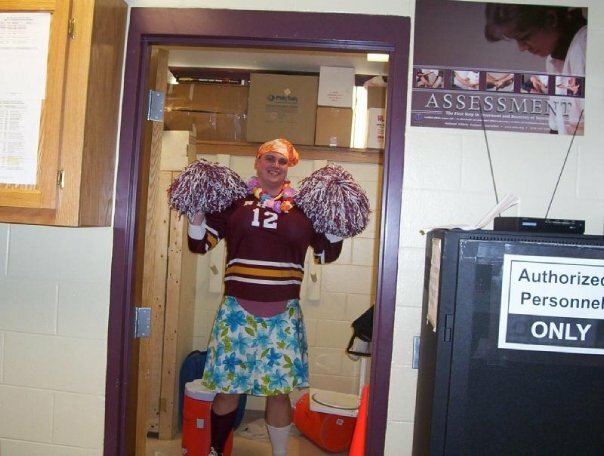 Great story, and without knowing him, you have to love anyone named "Big Jay!" My prayer is for him to be back on the team next year, as good as new. Thanks to everybody for the very kind comments. I know many of you were praying for Jay a couple of years back and I know he truly, truly appreciates it. I remember when Big Jay had the heart attack, and I'm very happy to see him back on the ball diamond. Keep looking after yourself Jay, I want to read more of Jim's accounts of your baseball exploits. Nice post Jim, I love hearing about your baseball buddies. Oh my gosh, that is so awesome! I remember his heart attack, although I can't believe that was 3 years ago. I didn't know about his other health issues. What an amazing tribute to friendship. Thank you so much for sharing this with all of us! And, as is obvious from the photo, when Big Jay boxes you out, you are well and thoroughly boxed out. . .
Again, my extremely sincere thanks to all who prayed for Jay, or otherwise extended helping hands. I have pure love in my heart for all of you. Even though this sport and its language is all worse than latin to me, I do get what it must mean to him to be able to play and play like THIS. Thank you Jim, The Incredible, for bringing this story and more prayers for you Big Jay!